You’ve never been known as someone who has trouble making decisions. But here you are swinging like a pendulum when it comes to following through on selling your business. You’ve taken your business as far as you can. You have other ideas about what you’d like to do with the rest of your life while you still have the health to act on it. Your wife is keen on travelling and although you’ve managed to take a vacation every year, it’s not the same as really stepping away from all the pressures of the business. It’s a weight you’ve carried for many years— your shoulders loosen up at the mere thought of releasing it. You want out. Last week you met with a business broker who worked with you to determine its most probable selling price. You won’t come away from the sale with as much as you first thought, at least not outright, as you’ll likely need to take back part of the purchase price as a loan to the buyer. It’s the one aspect you hadn’t accounted for. You’ll get a good return on your money, though. And the broker is confident you’ll be able to find the right buyer to look after the staff and customers with the same care you’ve shown them. You left the meeting feeling pretty good about your decision and with a likely date for taking your business to market. You’ve earned it. And yet —three days later — your closest friend, and your accountant and lawyer are urging you to put on the brakes. They remind you of all you’ve put into your business: Don’t you want more? Can’t you do better? How do you know you won’t be left holding the bag? Do you really want to risk all of that? They’ve got you rethinking everything. Now what? Poor health or an accident can force a decision when one is least prepared. We see it all too often. The owner has to take prolonged time off and the business suffers in their absence. Before you know it, the company’s best days are behind it. In a worst case scenario the outcome could be closed doors and employees out of work. 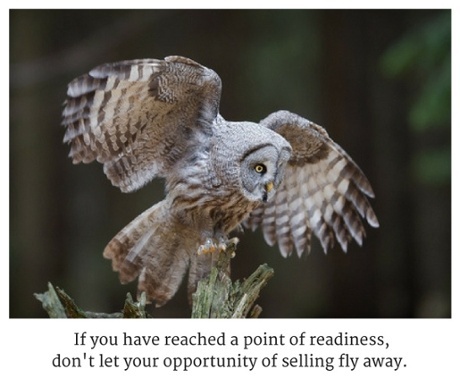 The time to sell is when the owner is ready, the business is ready and the market is ready. Most wait too long to start thinking about their exit and as a result, they end up selling their companies for much less than they could have. If you have reached a point of readiness, don’t risk your largest investment on an uninformed opinion. Our promise is we’ll do our best to serve your interests, to provide professional guidance, to educate and protect you. When we give you our report of the most probable selling price for your business, we will tell you if you benefit by going to market now. And if there are ways you could make your business worth more, we will advise you so as well. But you are in the driver’s seat. It will be your call as to which route is best for your circumstances. If you are serious about selling your business and you want the sale to be managed as expediently, professionally, and profitably as possible, you owe it to yourself to spend some time with a Sunbelt representative. Please contact the closest Sunbelt office at your convenience to speak with one of our representatives, who will be glad to answer any additional questions you may have. In this private and confidential interview we can provide further insights that will help you determine if your business is ready to sell and if your sales expectations are realistic.